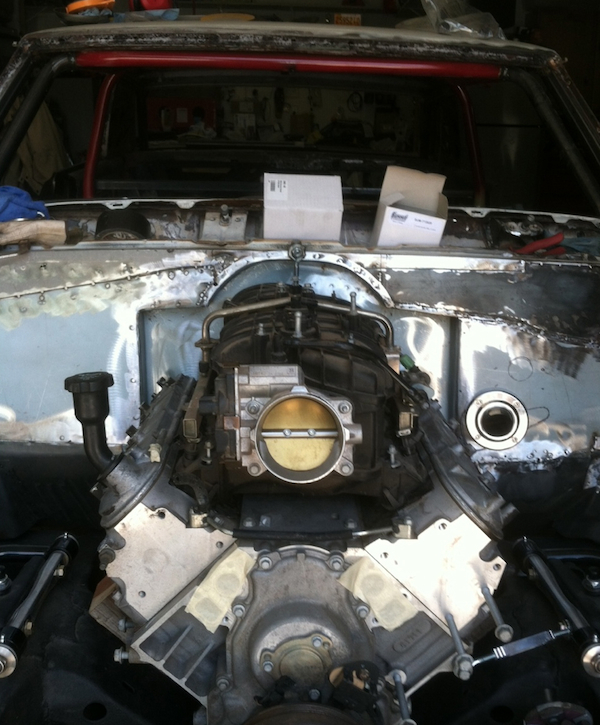 You are here: Home » Chevelle Build » June 2012 Chevelle Update: Firewall, Engine Placement, and Race Car A-Pillars! 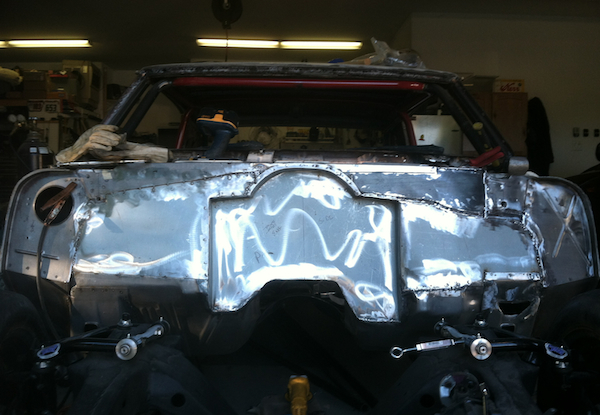 Allison Customs handiwork – a new firewall! It’s been quite a while since I put out the last Chevelle update, and as more than a few of you have asked for the latest news I thought that a pictorial spread might be the best way to go. Long story short, since my last update quite a bit has happened by Jeff Allison at Allison Customs from a work and decision making perspective that will dictate the remainder of the build. 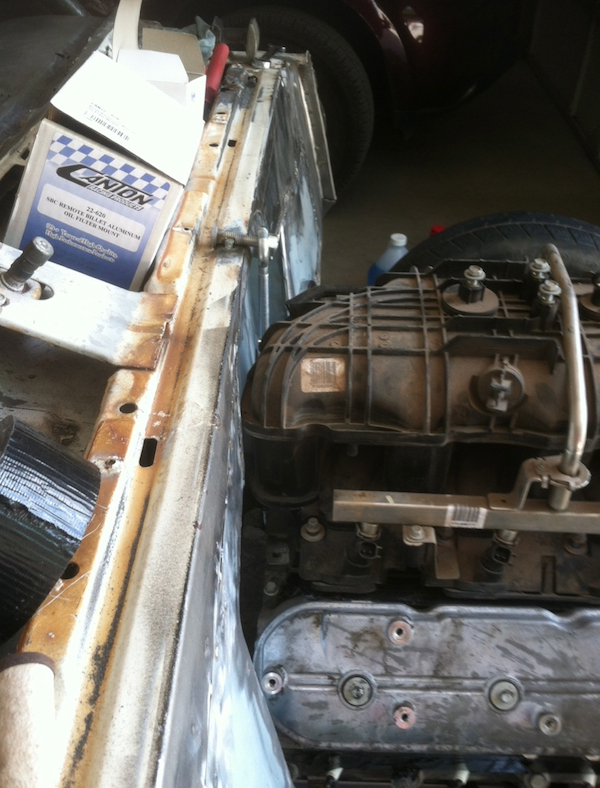 First and foremost, the location of the LS engine has been determined. As anyone can attest to, when placing a new generation engine into an old car the easiest route to go would simply be to place the new engine where the old one used to be….but what fun would that be? Since the car was already in a bazillion pieces we decided to take the opportunity to improve the handling of it even more and relocated the engine as low and as far back as was reasonably allowable (that didn’t require the engine in the front seat with me). 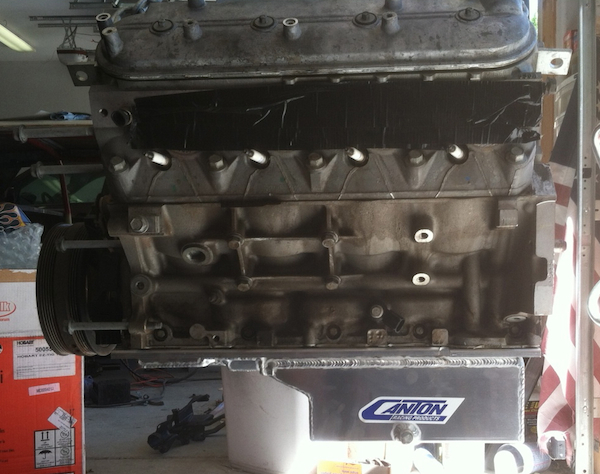 One of the secrets to our success – a Canton oil pan with a shallow front snout and a 5″ deep sump. This pan works perfectly with Jeff’s modified frame crossmember and gives us the ground clearance and steering gear components necessary. A remote filter and oil accumulator will be mounted somewhere in the engine compartment. Obviously, when working a problem with 5 variables it’s helpful to have 5 equations to solve to (thank you 9th grade algebra), but in this case we had a few fixed variables to work with that made things easier. First, I really wanted to keep the stock flat hood on the car, mainly so that when it all goes back together that it will still look like the car I remember. Since I also have a desire to have the option to run a taller truck-style intake manifold (which I’ll explain in another post) this required that Jeff get the engine as low as possible. After we poured through a number of books and online resources evaluating different factory style LS pans we concluded that some could work (an LS2 Corvette pan was the leading choice), but an aftermarket pan would be best. Since Jeff had already removed the factory cross-member and replaced it with tubing, we had the room available to us to go quite low. After talking with our pals at Detroit Speed and Engineering we learned that this choice would allow us to utilize their suspension design even better, anyway. Bonus! Side note: dealing with oil pan clearance is an absolute must at this stage: more than a few people have cracked and broken oil pans that slung lower than their cross member. Factory style LS pans are cast aluminum and are happy to crack when meeting the right speed bump! This shot shows the engine in place with the super-tall truck manifold installed. Plenty of clearance for the factory hood! Once we had chosen how low to go, the next decision was how far back to go. In actuality, the decisions of how far down and back to go were fairly intertwined, but for writing purposes I’ve separated them….mainly because I can’t figure out a way to easily mush them together into something readable. Long story short, the decision of how far back to go was both technical and comfort/cosmetic based. From a technical perspective I wanted the car to have as close to a 50/50 fore aft weight distribution as possible, and I also wanted the steering components to clear the oil pan completely (Chevelle’s generally require that the nose of the oil pan be notched to clear the moving steering parts). Cosmetically, and for my own driving comfort, I didn’t want the firewall pushed too far back into the car as it would: A) look goofy, and B) require me to have the gas pedal placed away from the spot that my right foot has become too accustomed to. Since my right foot has been a big part of my adventures in life I thought showing it a little courtesy was warranted. In the end, as the pictures show the solution Jeff came up with was pure genius, and the engine location, firewall design, and oil pan choice all took that into account. We had always intended to run an external oil accumulator as well, and the Canton pan (plus a couple of add-ons) gave us that option. The pan alone holds 5 quarts of oil, and the accumulator will likely hold another 2-3. Here we see that while the engine sits fairly far back when compared to the factory Gen I small block, that it really isn’t all that intrusive after all. The LS engine is 1″ shorter than a Gen I small block, and with a little fit and finish Jeff pieced it all together perfectly! Jeff had hoped that once the engine location was set that he’d be able to find a way to incorporate the use of a factory truck-style LS motor mount as he really likes to do that in his swaps (his theory is that when it breaks down 1000 miles from home a simple trip to NAPA is all it would take to get back on the road again). Unfortunately, the engine was a little too low slung to go that route cleanly….but that meant that he had the opportunity to make some custom mounts that will probably be bullet-proof anyway. In one of his next updates I’ll ask him to describe the process he used as it’s pretty sweet (and fairly simple). The last item on the docket will be headers….and honestly, we’ve decided that of everything that had to be decided, that one would just have to come last. Most companies that make headers for cars design them in harmony with the engine mounts (which is smart as the engine placement directly dictates that amount of real estate available for the headers), but in our case it will probably be a test-and-trial method with a few off the shelf headers, or just a complete custom set. Custom headers are not cheap….but a super-sweet-LS-powered-low-slung-bad-mother-awesome-handling-flat-hooded Chevelle is worth it. Wow, I need to Trademark that one! Well, I think I’ll wrap this update up at this point. 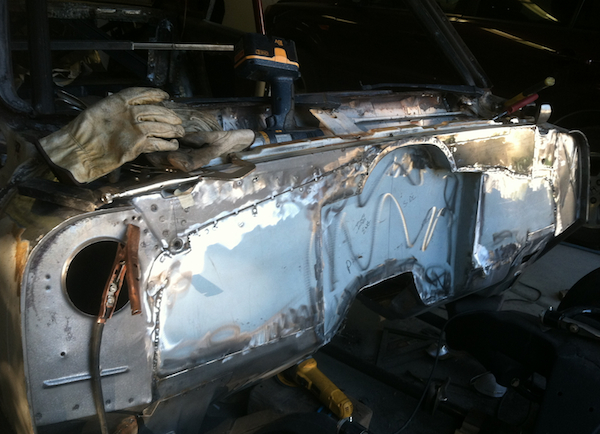 I’ll share in the next podcast show (and the next update) our final project plan for taking the Chevelle to completion. The good news is that we have a plan that looks very possible, but the bad news is that a November 1 SEMA appearance looks nearly unattainable at this point, mainly due to my immediate lack of funds to keep the parts flowing into Jeff’s capable hands. As I’ve shared in many previous posts, I run my business and personal life debt free, and while that’s hard to stick to at times I’ve committed to it whole heartedly. The Chevelle is the biggest marketing tool that my business will have, and I want it to be a blessing, not a curse. That just means we’ll finish the car on a pay-as-you-go strategy that leans on fantastic sponsor support, God’s provision, and some serious hard work! I’ll throw in a few more pictures below for fun….because they’re awesome. Also (and yes, this is a plug), I’d just like to mention to anyone wishing to have a mild or wild car built that this process with Jeff has been fantastic. Aside from the fact that the labor of the build has been free (which is huge), he’s gone out of his way to insure that the build of this car comes out how I want it to be. He’s really done a magical job of pulling out of me what it is I want to see, and from what I understand that can be a rare thing when working with a car builder. He wants the vision to be shared between he and his client, and I have nothing but pride in recommending him to anyone! Side shot of the new firewall. 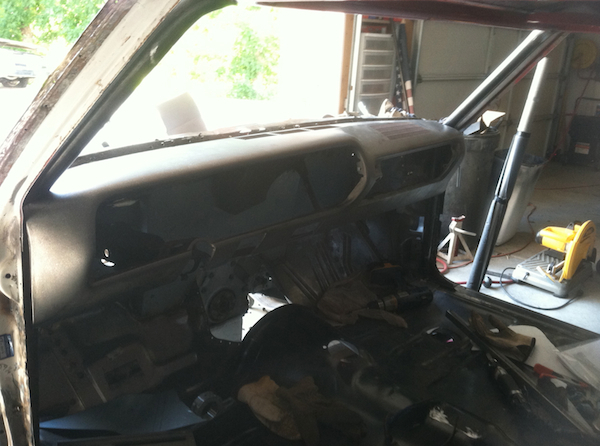 Dash back in for test fit! 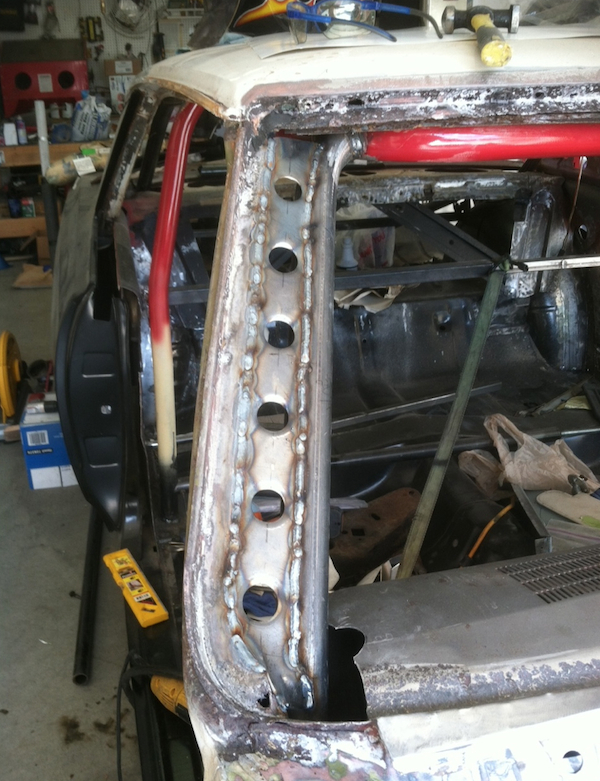 Jeff’s new NASCAR style A-Pillar-to-Roll-Bar filler panel!